Apple is rolling out facial recognition to unlock its new iPhone X, as has been rumored for months and confirmed in leaks over the weekend. The technology builds on Touch ID and is called Face ID, of course. It uses a new selfie camera setup in the iPhone 10 called the “TrueDepth camera system.” TrueDepth uses a set of sensors, cameras, and a dot projector to create an incredibly detailed 3D map of your face. Face ID starts with an image of your face, but builds on top of it with the TrueDepth’s dot projector, which will invisibly project over 30,000 dots onto your face each time you look at your phone, creating and building on its map of your features. “We use the image and the dot pattern to push through neural networks to create a mathematical model of your face,” Apple’s Phil Schiller explained. This facial map improves each time you look at your phone, and Apple says it will recognize you even if you change your hairstyle, wear glasses, or put on a hat. Apple says Face ID will require “user attention” to work, so if you’re looking away or have your eyes closed, your phone won’t unlock. Given Apple’s longtime emphasis on security, the team worked with special effects mask-makers in Hollywood to make sure it would be difficult to spoof Face ID. Consumers who are squeamish about letting Apple map their face can rest a little easier knowing that—just like with Touch ID—their biometric data is never shipped back to Apple HQ and remains stored safely on their device. 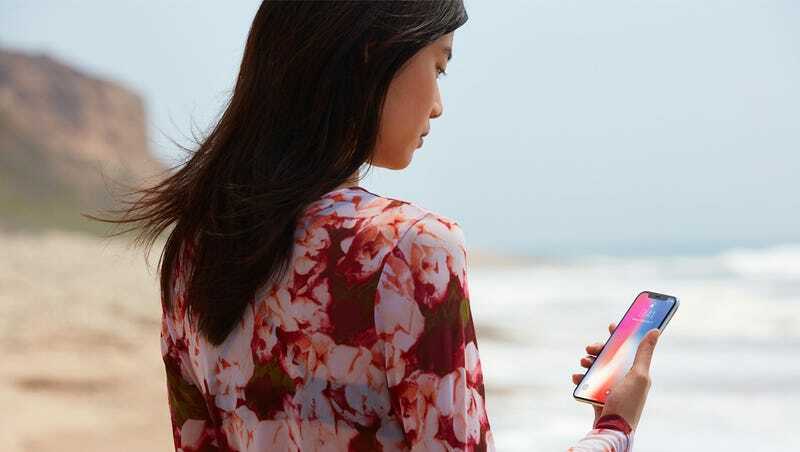 Face ID’s facial recognition technology will build on Touch ID in several key ways. Just as Touch ID builds a 3D model of your finger’s ridges, Apple’s facial recognition will create a 3D map of a user’s face, which should make it less susceptible to compromise (contrast that with this researcher’s experience unlocking a Samsung device with a selfie). But unlike Touch ID, which requires you to place your finger on the sensor several times during setup, FaceID only needs to scan your face once. Then you’re good to go. For Touch ID, the false unlock rate was pretty damn good: TouchID only had a 1 in 50,000 chance of unlocking for the wrong fingerprint. But Face ID is even better: it’s only got a 1 in 1,000,000 error rate, Schiller said. However, Face ID can still mistake you for a relative, Schiller explained. “The statistics are lower if the person shares a close genetic relationship with you,” he said. So keep that fancy new iPhone away from your evil twin.